Hello everyone! Today I'm writing this post to suggest a little update to CQB's iron sights. Now that an update for CQB is in the works I think it's the right time to do it. Currently, CQB's iron sights are placed too far away from the player's eyes in my opinion. This makes it difficult aiming through the iron sight, sometimes you can't clearly see what you're aiming at. And when you can't clearly see through the iron sight what's the point of it then? I'm not saying it is impossible with its current position but currently It is so tiny that it is difficult to aim at you're target specially if it is a medium/long range target. 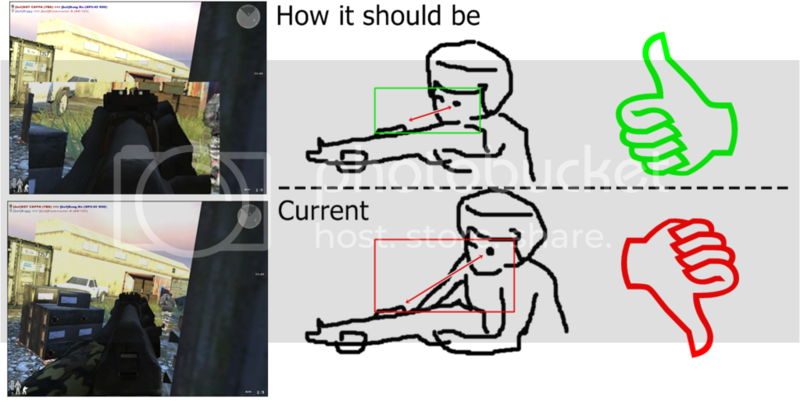 So my suggestion is to re-adjust the iron sights position a little bit backwards, something like TEC's iron sights and I'm not talking about the zoom here I'm talikng about the weapon and iron sights position only. No zoom. So there you have it, If coroner accepts this suggestion obviously there should be apllied some adjustments and tweaks to the unaimed weapon model too. so they fit correctly with the new position of the iron sights. what do you guys think? how do you like the iron sights? closer or farther? Somewhat closer wouldn't be bad indeed. Arm position is also a bit off imho, seems like the position of the elbow is too high. Well there are different preferences how one grips his/her weapon. lol, that's hilarious and extreme indeed. 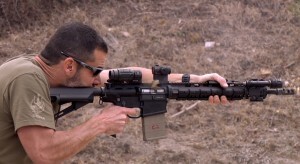 But what's more important of your pic is the position of the dude and his closeness to the scope. See how close he is to the scope... so... if the human eyes are the FPS camera then the scopes and iron sights should be closer to the players eyes, In case we want a realistic shooter, right? oh btw, the forearm is kind of exaggerated. Maybe he's trying to feel heat of the weapon?